My maternal grandmother died on what would have been the 50th birthday of her daughter, who had died at the age of 10. My father mentioned it in passing and observed softly that it can take a long time to get over someone’s death. This is true. People come into our lives without notice, without bugle call and press release. They go without saying anything sometimes. And they return in the same way. I had grieved and done with grieving, I thought, for my friends who died in the late eighties for the crime of having been born in the wrong decade, but they returned and demanded fresh tears one inauspicious day in the year 1998 as I watched a documentary about characters and events captured in the telling recounting of the ouster of Salvadore Allende’s democratically elected Government in Chile in 1973, Battle of Chile. The sequel aptly titled Chile: Obstinate Memory was shot by the same film-maker, Patricio Guzm n, in 1997. It called forth ghosts that had refused to leave memory in terms of time’s dictates which I had thought held but that is another story. Today I am writing about a different arrival. It happened last Saturday. Maharagama Youth Centre. A concert in aid of an artiste who needed a kidney transplant. Sandakadapahana. 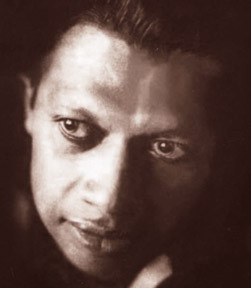 Sunil Edirisinghe. There was a poorvikaava (introductory) to each song, enlightening a full house of circumstances that birthed composition, implication of thought or some musical oddity. At one point the artiste spoke, in his characteristic mildness, about a lyricist. Premakeerthi de Alwis. He rattled off some of the better known compositions to which he, Sunil, had added voice. He spoke wistfully about Premakeerthi. He didn’t mention the circumstances of his absence, i.e. the fact of his ‘absenting’. On July 31, 1989, exactly 21 years ago, a group of masked men led Premakeerthi de Alwis, then a presenter attached to Rupavahini, out of his house. He was shot dead. The murderers, without doubt, were members of the deadly Deshapremi Janatha Vyaparaya (DJV) and that meant ‘JVP’ back then. His ‘crime’ apparently was that he had ‘announced’ at a Gam Udawa. He was 42. Today, Premakeerthi, had he been alive, would be 63. He was at the time of his death a prolific lyricist and a much sought after one too. Sunil mentioned Muniseku pita negi asaruweki (‘A horse riding a man’, naturally about gambling) and Banen benda rajarata pedesinne (a poignant song decrying cattle slaughter). I checked the Internet. I was stunned. Readers don’t really know who writes the news stories they read in newspapers because very few look at the bylines. It is the same with lyricists. We know the songs by heart. We know who sings them. We don’t really know who wrote them. I found that most of my favourite Sinhala songs were penned by this man. I realized too that while I do appreciate melody, it is to the lyrics that I am more attached. I am not unappreciative of voice and melody of course. I love the compositions of Rohana Weerasinghe, H M Jayawardena and some of Khemadasa’s melodies. I can listen to Amaradeva for hours. Victor Ratnayake’s voice makes me float. Gunadasa Kapuge makes me sober. Sunil Ariyaratne enchants with what to my untrained ear is the achievement of a pure tone. T M Jayaratne can make me cry. I could go on. No, on second thoughts, I can’t. I can see Premakeerthi with his grin, his caustic turn of phrase when irked and the music of word conjugation, standing beside this orchestra of voices. He gave me Aadaraye ulpatha voo amma (‘Mother, the Spring of Love’) and Sihina sathak dutuwemi mama (I saw seven dreams), using Victor Ratnayake. He made me laugh, though Freddie Silva’s rendering of Nikan innepa kohoma koma hari gahapalla ban pethsam (Don’t waster time, write petitions) and made me dance with Kundumanee (again by Freddie). I have returned to TM’s Sithin ma noselee sitiddi kandula numba evidin (Tears, you have come to alleviate the eye’s pain), Mervin Perera’s timeless love song, Me nagaraya (This city - where we met and parted) and Oba dedunna aakasaye (You are the rainbow in the sky), Milton Mallawarachchi’s Sihinen oba mata penenavanam (If I see you in my dreams) and hundreds more. Yes, I am aware that I’ve given ‘ownership’ to the singers. That’s a slip. They should belong, at least in part, to the lyricist. And of course to the listener. To me. In 1996, I joined a set of Peradeniya undergraduates on a bus going to Colombo for a demonstration against proposed education reform. I was not a student, but I identified with the cause and got permission from the student activists organizing the protest. They were all JVPers. There were in that bus students opposed to the JVP. They had unsuccessfully tried to oust the JVP from the Arts Faculty Students’ Union. There was tension, but not too intense. On the way back to Kandy, after being baton-charged and tear-gassed, the students did what they usually do on long bus rides. They sang. The JVP boys used song to crow over their rivals. The song was Kanda kenda karanu pinisa. It essentially said that mountains will not be shaken, but those who try to shake mountains will necessarily fall. The point was not lost and the humour was taken in the right spirit. I am sure the JVPers would have known that it was sung by Malini Bulathsinhala. I am sure also that they would not have known that it was written by a person called Premakeerthi de Alwis. The world and life are made of songs. They need to be written down. Listening to Sunil Edirisinghe, I realized that there are hundreds of songs that will not get written. Ever. We can’t name the colours that we have not seen. We can’t write the songs that were meant to be written by a particular pen. Premakeerthi de Alwis is dead. I want to be silent for a while. Better still, I will go listen to some songs. We need to be thankful for what we have.